At E3 2018, The Coalition Studio Manager Rod Fergusson went on stage to reveal not one but three Gears games. 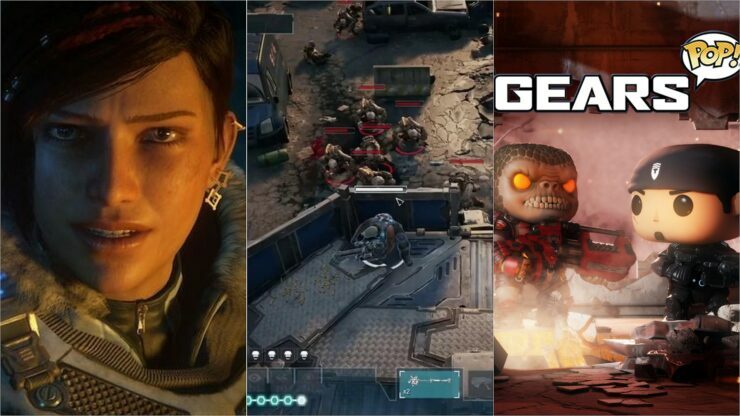 Gears 5 was the one fans expected, of course, but The Coalition also partnered with Splash Damage on the PC focused turn-based strategy game Gears Tactics and there’s also a Gears Pop game on the way for mobile devices. Last week, Fergusson appeared in a live streamed interview during the X018 fan fest in Mexico City and provided additional tidbits on all three games. He started with Gears 5, reiterating that this game will be less safe than Gears of War 4 and packed with a bunch of innovations. He added that this will be the first game in the series to feature performance capture, and a major theme throughout the title will be ‘dramatic contrast’. Gears 5 is about bringing The Coalition’s personality to the game. You’re going to see a bunch of innovations, a bunch of changes, a bunch of things that are really exciting and different but still feel like Gears of War. We focus on contrast, ‘dramatic contrast’ is the wording we use. We wanted to have part of Gears 5 as dramatic contrast, like going from very small, cramped spaces to very large open spaces or like going from the desert to frozen tundra. We wanted to have, through the experience, constant contrast and dramatic change. For the first time in Gears 5, we’re doing performance capture. All the previous games had separate voice from motion capture with different actors doing it. It was a really natural decision. When we went back and we looked at what the story of Gears of War 4 was, like with Mad Max Fury Road, that movie is really about Furiosa’s story and Mad Max is helping her complete her story and Gears of War 4’s story is really Kait trying to save her mom and JD Fenix is helping her. When we looked at the story for Gears 5, we were sort of delving into Kait’s past and her history, her family ties to the locusts, we felt like that’s a better story to not just witness but tell from her perspective. Organically we realized Gears 5 is Kait’s story again, so let’s play it from her perspective. The Studio Head then talked about Gears Pop, which is the closest game to release among the three. We’re getting ready for soft launch. In the mobile world, you release the game slowly over time, because you have to sort of test it in the wild and make sure it’s working. You don’t just globally make the game globally available. We’re getting ready, we’re not there yet, but very soon we’re gonna sneakily put it in one place and test it, then we’ll grow it until it’s everywhere. Gears Pop is the first of the three games that’s going to launch. We’re really excited, our relationship with Funko and the idea of taking that Pop art style, it feels like it really belongs. This feels authentic, it doesn’t feel like a cheap knock-off, it feels like this is Marcus Fenix. It’s a great partnership with Mediatonic and Funko and ourselves. We have a great mobile experience that I think fans are going to love. Lastly, work is being done on Tactics as well and according to Fergusson, the core essence of Gears translates well to the genre. We’re right in the heart of the development for Gears Tactics. One of the things we’re focusing right now is ‘PC first’, we’re really trying to make sure it’s true to what a PC experience has to be. What’s really funny is that when you take the gameplay and make it turn-based strategy, the dependency on your squad and cover feels like it’s Gears of War at its essence of that brotherhood and tactics, that’s what it’s really about. If we had to bet, we’d put Gears 5 as coming out in October 2019, about three years after the previous entry. Of course, right now that’s all speculation and we should learn more at E3 2019.